Chemical industry M&A has remained highly active in 2017 while capital spending on expansions is forecast to decline to levels not seen since the late 1990s. The industry this year has seen activist investors flex some muscle and impact the outcome of two major mergers: DowDuPont and the Huntsman-Clariant. Is this a one-time phenomenon or another complication company leadership must navigate while employing M&A strategies for the future? Basic chemicals are the essential building blocks from which significant quantities of durable and non-durable goods are produced. Chemicals such as such ethylene, propylene, methanol, benzene, chlorine and paraxylene are the feedstocks for major value chains that produce a wide variety of intermediates, plastics, elastomers and performance materials that ultimately are converted into consumer goods. Energy market trends, global economic growth and regional trade dynamics are all key factors influencing investment decisions to add new world-scale capacity. These are multibillion dollar investments that are seeking a sustainable competitive advantage in terms of energy and feedstock costs, technology and scale, proximity to markets, and degree of integration. Uncertainty in global crude oil markets, along with the high degree of economic uncertainty that developed during 2014 through 2016, were key factors leading to what IHS Markit sees as a disruption in the chemical industry build cycle. As decisions to build new capacity were delayed or cancelled during this period, chemical industry capital spending shifted toward mergers and acquisitions. While shale-based investments in the United States are providing a boost to chemicals capital spending, the overall trend is a decline, dominated by reduced spending in China and the rest of Asia. Low-cost access to debt, strong equity pricing, and weak earnings resulting from falling commodity prices in 2014 and 2015 have also been key factors behind the surge in M&A activity. During the latter half of 2017, commodity prices and global GDP are increasing and industrial production is improving. Demand growth in basic chemicals is steadily improving and is forecast to continue accelerating, as long as global economic growth continues. Given forecast demand growth and the basic chemical capacity expansion profile during the next three to four years, asset utilization will rise resulting in strong profitability for the industry. Targeted M&A activity can provide producers the opportunity to grow capacity and margins through cost savings and growth synergies. 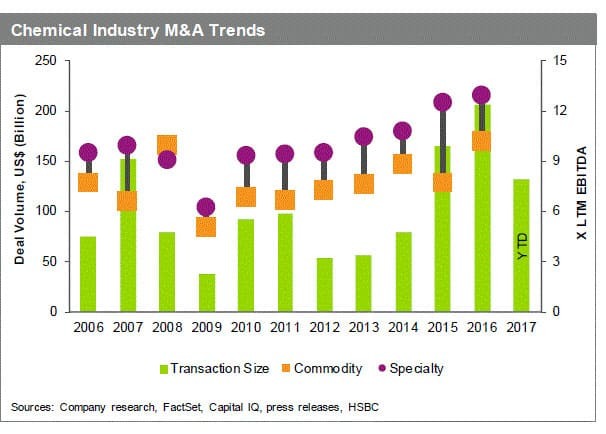 For both commodity and specialty markets, M&A deals surged during 2015 and 2016, both in terms of deal volume and multiples being paid. Merger activity in 2017 has continued, although it appears at this point that 2016 will represent a peak year. We expect to see more attempts at mergers as we head into 2018 as M&A represents an opportunity for growth. During 2016 and 2017, activist investors have made their presence felt in the chemical sector. Investors were successful in disrupting a deal that would have created a specialty chemical leader, Huntsman-Clariant, and while the DowDuPont deal was not prevented from advancing, investors were successful in pressing for significant changes in the makeup of planned spinoffs. Clariant abandoned a planned $20-billion merger with Huntsman after activists gained a 20% stake, enough to effectively block a deal. DowDuPont, meanwhile, will shift businesses with $8 billion in annual revenue from its planned material science spinoff, which will retain the Dow Chemical name, to the specialty products spinoff as part of a previously announced portfolio review amid pressurefrom a group of activist investors who had pressed leadership for the shifts. A chemical industry executive recently referred to this shareholder activism as a "destructive and dangerous development for chemical companies." From the industry perspective, the activist shareholder is seeking a fast payout, with little regard for long term strategic implications of their recommendations. They want faster money and have shorter timeframes that are generally measured across quarters or a few years. Find out about our expertise and insight to support client investment, financing and portfolio strategy decisions. If the activist shareholder is here to stay, it creates significant challenges for chemical industry executives. Activists are seeking more focused and narrower portfolios along with near-term initiatives to drive higher results and higher valuations. Longterm strategic planning likely does not exist in the activist shareholder playbook. Chemical industry executives must balance this against the need to build, sustain and improve the enterprise value against a backdrop of volatile and changing market cycles. Energy markets, consumer markets, technology and regulatory framework are all in a constant state of change, creating uncertainty and volatility in ity. Today's short term initiatives that result in high profits could be tomorrow's fatal flaw, given a shift in energy or demand trends. In the chemical industry, investment planning, spending and project execution for critical assets can take five years and billions of dollars. The assets are built and sustained in order to have a useful life of 50-plus years. It's a business driven by short-term tactical decisions that must be aligned with long-term strategic planning. Today's decisions to maximize profitability must contribute to long-term strategic plans aimed at building up enterprise value and reputation over time, meeting the needs of all stakeholders including investors, employees, local communities and the general public. Assuming that the activist investor is only focused on short term gains with little to no regard for long term strategic implications, then the warning that this development is "destructive and dangerous" for the industry may have merit. Considering the global perception of the chemical industry today and the increasing need for corporate metrics that demonstrate as much concern for sustainability programs as there is for an acceptable return on investment; all stakeholders in the industry must work together to ensure there is an appropriate balance of priorities and investment that continues to advance sustainability efforts while building long term value in the enterprise. Visit www.ihs.com/cca to find out about company analysis for strategy and portfolio optimisation.